We stayed at Hotel Claris, located in the Eixample neighborhood. I would recommend this hotel for location, service, beautiful rooms, and an awesome roof top terrace. As we checked in, we were offered a glass of champagne. The concierge opened up a map and pointed out the city’s landmarks and how to navigate our way. If you want to splurge at this hotel, you can arrange a private brunch on the roof top terrace, too! Exploration Tip: We purchased a metro pass, but discovered that we could have probably done without. It wasn’t as convenient as taking the metro in Paris. The station locations still required quite a bit of walking to get to your destination, so walk until you get tired and take a cab. 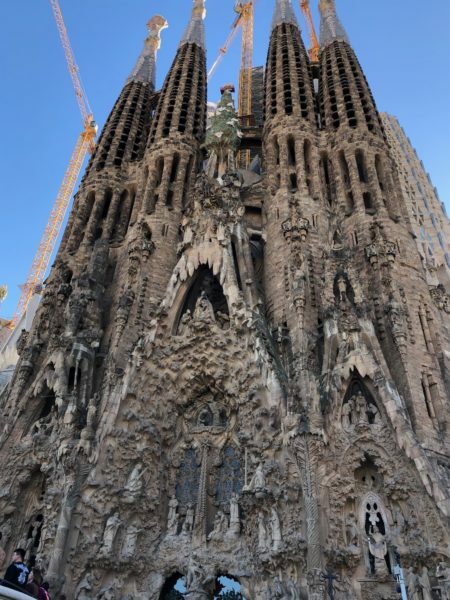 We took in the city heading to La Sagrada Familia. The architecture was amazing. It was as you would expect: old world, but yet modern mixed in. The basilica itself was so impressive! I would recommend everyone add it to their itinerary. We didn’t do a private tour, but those are available. 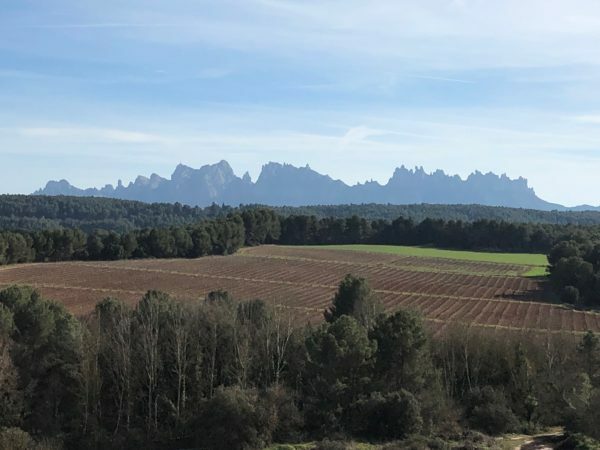 One of my favorite adventures was a trip to Montserrat National Park and Sanctuary located about an hour away from Barcelona. This tour is a must! Our tour included wine and tapas at the Oller del Mas boutique winery afterwards. Our guide, Alex, was so informative and funny – he shared the history of Catalonia and advised us on where to sit for the best views. And the views from the cogwheel train are fabulous! Pictures don’t capture the beauty. Between the tour and the winery, we had free time to visit the art museum they have on site, hike and explore more of the park, shop at the various booths set up selling cheeses, honey, etc. or buy trinkets in their gift shop. The winery was beautiful and they have plans to expand so when that is complete you will be able to stay and play on the grounds. 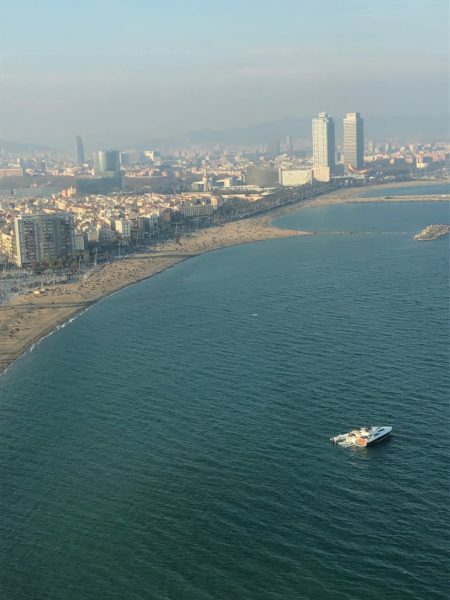 You can’t visit Barcelona without seeing the waterfront. There are tons of place to eat, drink and people watch. We were told to have a drink in the bar on the top floor of the W Hotel to experience the absolute best view of both the city and the beach. The bar upstairs doesn’t open until 5:00 and there was a long line to get in. It was worth the view, but one drink was enough. Our last tour was to Parc Guell. Antoni Gaudi’s work is amazing. Everywhere we looked there was something more unique because of all the different colors and textures. Be careful when you are walking because some of ground is uneven - I was trying to get this great picture and I apparently wasn’t aware of the tree root that was between me and my photo op when I almost tripped! I would also recommend eating before you go and bring a bottle of water. We paid 6 Euros for a bottle of water! Shopping Tip: For those of you who like to shop, they have all the high-end stores. We found that if you are in need of souvenirs, don’t pay the full price. Walk away and they will barter with you. We wanted to experience paella our first night and we went to Bodega Joan. 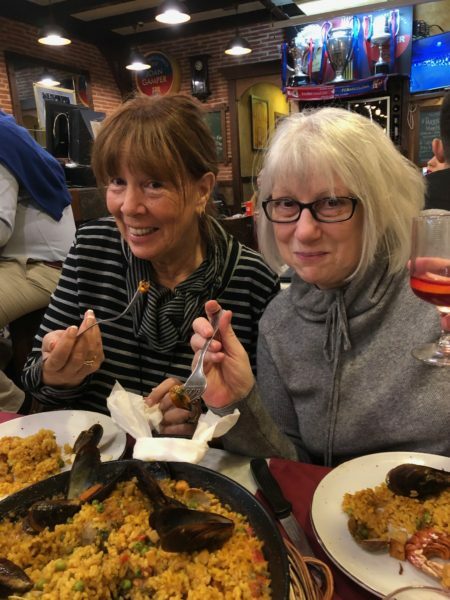 Before the paella was served, we enjoyed 3 tapas and a pitcher of sangria (which I normally shy away from) but it was tasty. The coffee was the best! Café Con Leche and it was delicious. Starbucks move over, Roast Club Cafe is taking over. It is this small 12-seater café with a ton of personality because of the owners. They work their magic serving up delicious coffee and small bites all within walking distance from our hotel. We also enjoyed Cuidad Condal, a recommendation from our previous tour guide, Alex. It was within walking distance from where the tour bus departed. The prices were a bit higher at the Sensi Mezzanine, but definitely worth it. All in all, we loved Barcelona and all that it offers. Next time we would love to see more of Spain. Interested in exploring Barcelona? Give me a call, I’d love to help you plan the perfect trip and offer recommendations! 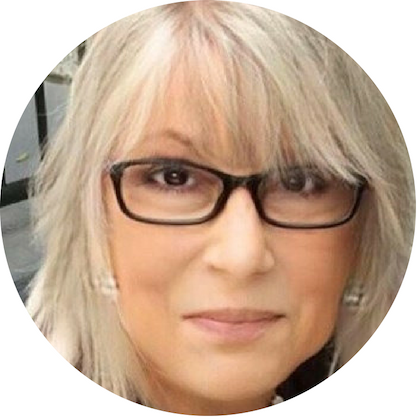 Denise is the Director of Leisure Travel at UNIGLOBE Travel Designers and loves working with people to make their vacation dreams come true! Since her husband is in the wine business, they always find unique wineries and wine bars in their travels. "If you ever need help picking the perfect wine, call my husband. If you need help picking the perfect vacation, call me!"